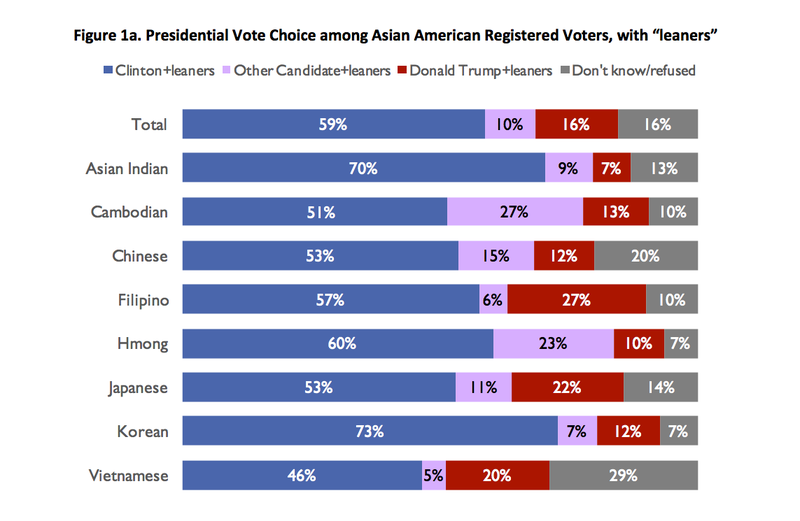 Even beyond sample-size issues, polling Asian-Americans can be difficult. Asian-Americans have one of the highest rates of limited English proficiency, and about 3 in 4 are foreign-born. For these reasons, 45 percent of the interviews in the NAAS were conducted in one of nine languages other than English (Cantonese, Mandarin, Korean, Vietnamese, Tagalog, Japanese, Hindi, Hmong, Cambodian). Indeed, “Asian-American” is a broad group that includes many different ethnicities with distinct political traditions. Vietnamese-Americans have historically leaned more Republican than other Asian-American subgroups, for example; Indian-Americans and Japanese-Americans have leaned more Democratic. Still, Democrats have made substantial gains across most ethnic subgroups of Asian-Americans. Ramakrishnan said the GOP appeared to be making strides in some areas, pointing to the 2014 election of several Asian-American Republicans to seats in California’s state legislature. But he said that the polarizing nature of this year’s GOP presidential nominee seems to be nullifying any gains Republicans might have made and that support among Asian-Americans for the GOP may be lower now than in 2012. In previous years, Ramakrishnan said, surveys of Asian-Americans showed larger differences in political preferences between subgroups and between regions of the country. “One way you could put it is that Trump is nationalizing the election for Asian-Americans,” he said. 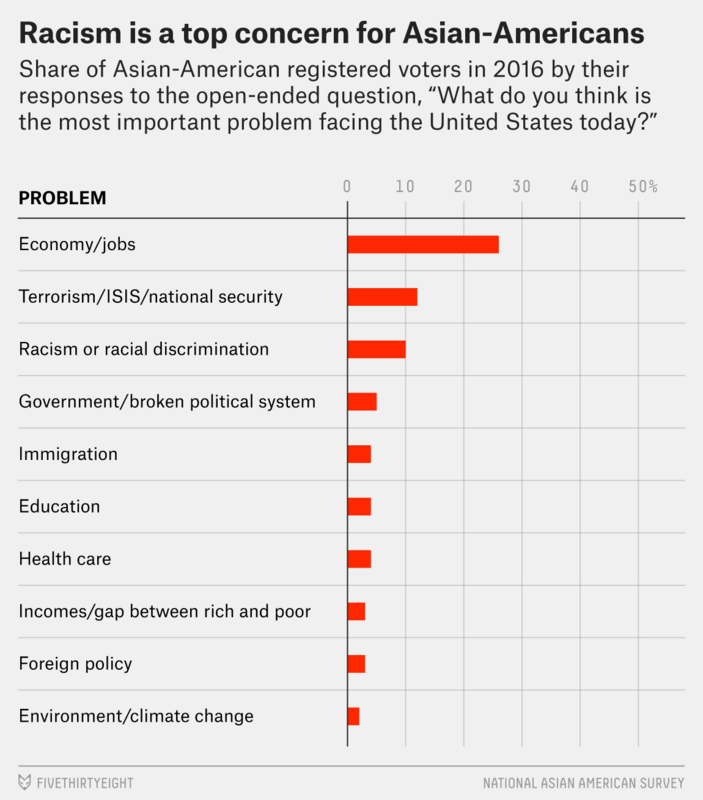 Trump’s effect on the concerns of Asian-Americans may be evident in an open-ended NAAS question that asks respondents to name the “most important problem facing the United States.” Ten percent of registered voters in the NAAS said “racism or racial discrimination,” the third-most-common answer, behind the economy and national security. Trump has been criticized for anti-immigrant and racist rhetoric, including saying that Mexican immigrants are rapists, and for proposing to temporarily ban Muslims from entering the country. In 2012, only 2 percent of likely voters cited race or racism. Both the party identification and horse-race numbers include respondents who said they lean toward one party or the other. The survey was conducted from Aug. 10 to Sept. 29.